Irrigation and Fittings. No dead plants because you are on your wonderful travel or forget the watering daily life. No water wasted through watering root directly. > indoor use only. Portable 4 Shelves Wall in Greenhouse Outdoor Gardening Plants Hot Green House. 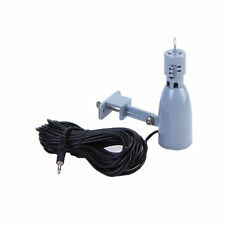 > Enables the Rain Sensor to be adjusted for detection of rainfall from 1/8” to 1”. > Universal Mounting Bracket Enables the Rain Sensor to be mounted on an angled surface then easily adjusted to the vertical position. Irrigation and Fittings. 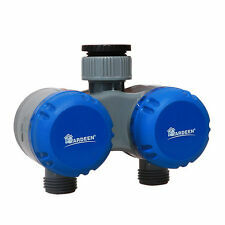 >One 4-way water distributor and two solenoid valves are included. 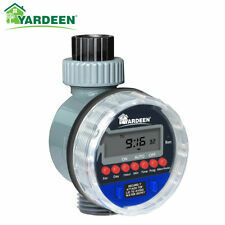 >Working water pressure: 0.5-8 BAR>Working water temperature: 5-60 degree. We want to make your garden life wonderful. Irrigation and Fittings. 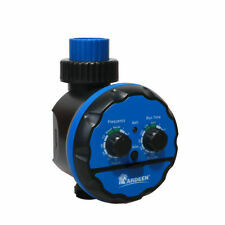 >One 4-way water distributor and two solenoid valves are included. 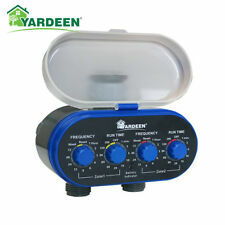 >Working water pressure: 0.5-8 BAR >Working water temperature: 5-60 degree. We want to make your garden life wonderful. Irrigation and Fittings. It can be connected to hose faucet directly. > Can be attached to3/4"(19mm) tap or faucet. New Arrival. With waterproof design can prevent rain effectively. > How to use DELAY button. It works with 2 AAA Batteries (NOT INCLUDED). > Can be attached to 3/4"(19mm) tap or faucet. > Durable high impact construction. We want to make your garden life wonderful. Gardeen Tool. This does not affect your statutory rights. > Frequency: (can be set at 1, 2, 3, 4, 6, 8, 12, 24, 48, 72 H, and Week). The use of smart irrigation system not only makes effective use of water resources, but also improves the efficiency of automatic irrigation and greatly reduces labor costs. > Can be attached to 3/4"(19mm) tap or faucet. Irrigation and Fittings. > Manual Watering: Available (can be set from 1 min. up to 240 min). >Rain Delay button : You can set to delay watering by 0H,24 H, 48H, or 72H. > Can be attached to3/4"(19mm) or 1"(25mm) tap or faucet. Irrigation and Fittings. 10x Barb tee. 1x Pressure regulating barb. > Max Lift Height: ≤5m. > Flow Rate: 250ML/min. > Max Pump Suction Height：≤2m. > Use 3 XAA 1.5V Alkaline battery (not included). 1x 10m PVC Hose. Irrigation and Fittings. > Can be attached to 3/4"(19mm) or 1"(25mm) tap or faucet. We want to make your garden life wonderful. Gardeen Tool. Endding Soon. > Durable high impact construction. We will not bear the back freight if it is not the problem of product quality. 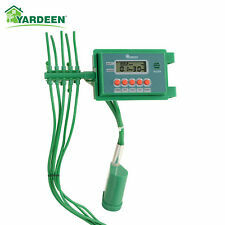 In a word, it's really a perfect watering tool for micro sprinkler and drip irrigation in the garden, yard and balcony. Water Temperature: 0-40°C. Power: 12V. 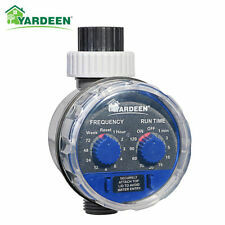 Hose Timers 2 Outlet Garden Digital Electronic Water Irrigation Controller For "
TWO PROGRAMMABLE VALVES - Features two separate valves maximum flexibility settings. MAXIMUM FLEXIBILITY - Allows setting your precise desired frequency duration. Program precisely when to start watering, when to stop watering. Follow the instruction, programs are easy to setup. Ball valve you water with impurity water. 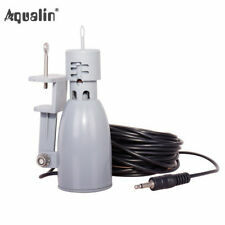 And it attach to 3/4"(19mm) or 1"(25mm) tap or faucet. 2 separate valves with maximum flexibility settings. HAY UN AGUJERO PEQUEÑO EN CADA TUBERÍA, SEGÚN LA FOTO, ESTE ES UN AGUJERO ÚTIL QUE NECESITAMOS PARA LA BUENA FUNCIÓN DE ESTE SISTEMA. Riegue de forma automática sus plantas y flores de manera precisa y cómoda. 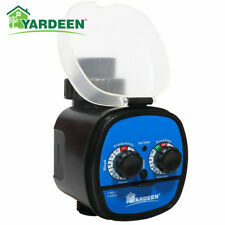 Convenient Multi Container Watering System can keep up to 10 container plants perfectly watered. Watering the garden, potted plants, shrubs and trees is no longer a chore, its fun. Reduce 70% water than traditional sprinklers by focusing water directly to the root. Unit Type: piece. Item Specifics.